Candidates who wish to apply for TSECET-2016 are requested to fill the particulars carefully in ONLINE APPLICATION. The required information should be collected from the relevant documents. All the candidates have to come to the Examination hall with a printout of Online submitted application. The candidate has to affix the passport size photograph (should be same as that of uploaded) duly signed by Gazatted Officer. Candidates are not admitted to the examination after 10.00 A.M. and not permitted to leave the hall before 1.00 P.M. It is the responsibility of the candidates to ensure that they are answering the correct Question Booklet of the branch for which they are eligible for admission. The Question booklet code, Hall Ticket Number and other details must be entered correctly and properly on the OMR Answer Sheet, in the Test. Other wise ranks declared, if any wil be cancelled subsequently in such cases. Candidates must return both Question Paper Booklet Acknowledgement slip and OMR Answer Sheet after the test. Question paper will be in English only. Hall ticket No. of SSC or Equivalent examination Certificate - SSC or Equivalent Certificate. Recent passport size digital color photograph (size < 40 KB) of candidate for uploading . Digital Signature of the candidate (size <20 KB) of candidate for uploading. 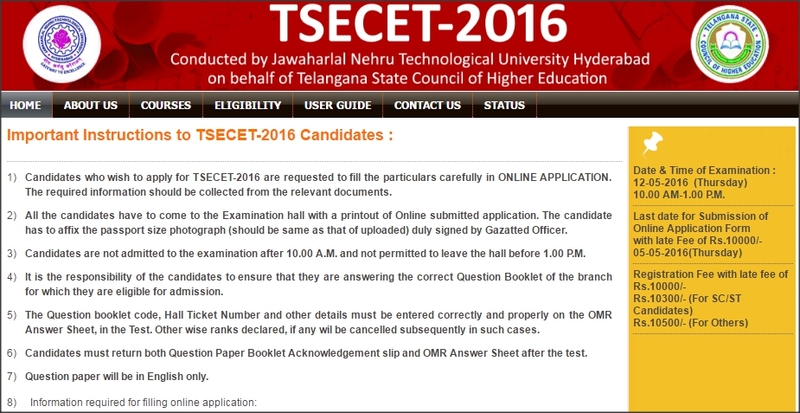 Examination Center to which candidate wishes to appear TSECET-2016 exam. Place where Studied Diploma/Graduation - Corporation/Municipality/Rural area .